Living a Fit and Full Life: Show Your School Allegiance with SweeTARTS® & BUTTERFINGER® Limited-Edition College-Themed Candy! + Sweepstakes! Show Your School Allegiance with SweeTARTS® & BUTTERFINGER® Limited-Edition College-Themed Candy! + Sweepstakes! SweeTARTS® is back for a second year to kick off the 2017-2018 college football season in a sweet way with five new NCAA schools. Limited-edition, officially licensed SweeTARTS® Gummies will feature the logos and mascots of 10 total colleges this year including new partnerships with – University of Michigan, University of Arizona, University of Oregon, University of Georgia and University of Florida – as well as the original five schools from last year – The University of Texas, The Ohio State University, University of Tennessee, University of California, Los Angeles and University of Arkansas. Limited-edition college-themed SweeTARTS® Gummies (8.0oz/MSRP $1.89), BUTTERFINGER® Bars (3.7oz/MSRP $3.49) and BUTTERFINGER® Peanut Butter Cups (3.0oz/MSRP $1.89) will be available in bookstores and stadiums at the 10 partner universities August 2017 through December 2017, while supplies last. Fans not on college campuses can visit a variety of regional retailers and online to get their collegiate sweet fix. Enter for a chance to win the ultimate outdoor tailgate package (a stainless steel gas grill, home cinema HD 3D projector, portable movie theater projector screen and more valued at over $6,000 ARV) or one of over 1,000 other instant prizes, from August 1, 2017 through March 31, 2018. Sweepstakes details and rules can be found at www.butterfinger.com/college. Show your school allegiance with SweeTARTS® & BUTTERFINGER® Limited-Edition College-Themed Candy! I had the pleasure of trying SweeTARTS University of Arizona Gummies and oh my word are they delicious! I love the cute little wild cat faces and little A's as do my kids! 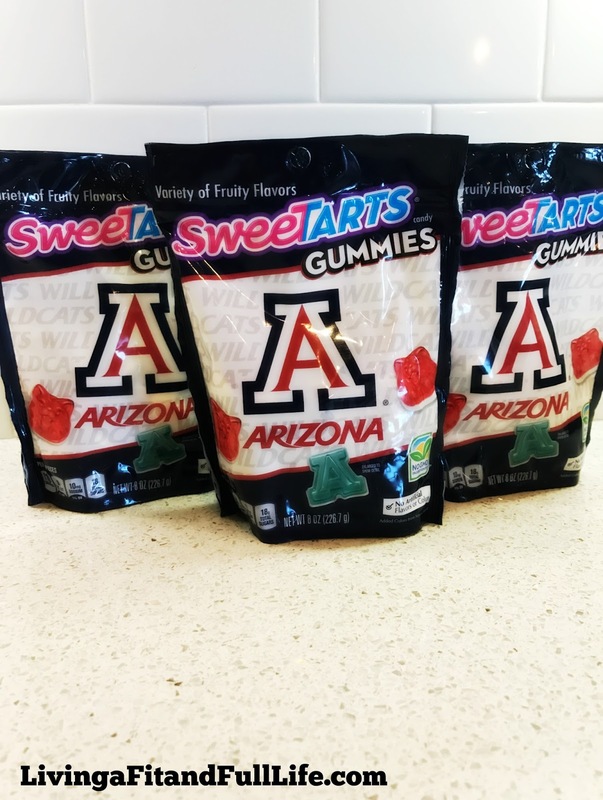 If you attend University of Arizona, how cool would it be to walk around campus snacking on these delicious gummies from SweeTARTS. They taste incredibly fruity and make the perfect treat anytime of day. SweeTARTS University of Arizona Gummies are the perfect way to show your school spirit and I highly recommend them! Be sure to enter to win Ultimate Tailgating Sweepstakes that's going on right now!